You can find about 1000 private holiday rentals and cabins all over Denmark - look out your holiday cottage and enter an agreement direct with the owner into the right price. You can find a large collection of lovely private summer cottage or holiday homes along the north coast of Zealand with wonderful bathing beaches with the blue flag and fresh and clean water from the Kattegat and Øresund. North Zealand is the holiday area for the kings of Denmark during centuries because of the beautiful and friendly landscapes and many woods for hunting. Now a days you find the most exclusiv holiday areas with wonderful cottages and holiday houses for the most choosy taste. The holiday villages are Alsgårde, Dronnigmølle, Hellebæk, Hornbæk, Gilleje, Rågeleje, Asserbo, Evetofte, Liseleje, Tisvildeleje and Hundested. Copenhagen, the capital of Denmark can be reached from any place on Zealand for a visite to experience a great city or metropol with a lot of attractions, museums, shopping and entertainement of international class. West Zealand has a lot of nice holiday areas with all kinds of cottages and good bathing beaches. The Sejerø Bay with the villages Højby, Højby Lyng, Tengslemark Lyng and Gudminderup is very nice. Around Nykøbing are many holiday cottages incl. Sjællands Odde and the charming Rørvig with a ferry to Hundested. At The great Belt is Røsnæs and Stillinge Strand good choises for a nice cottage holiday. In South Zealand is Karrebæksminde and Fakse Ladeplads some of the best places. Zealand is a wonderful place for a golf weekend or summer vacation for the whole family. 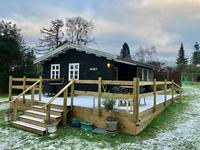 We wish you a very nice holiday in a private, cosy holiday home in Denmark - maybe on Zealand! Light and child friendly cottage on great land, plenty of space and charm and 10 min by car to beach. Sunny, large site facing open fields and great views. 3 bedr, large corner lounge with plenty of dining spaces and large roofed terrace. 100 m2 holiday house for 6 persons on 2.000 m2 naturesite. 4 bedrooms, livingroom with woodburner. New bathroom. Terrace. 1.000 m to a dream beach. See more cottages on Zealand - find them by searching in the seach form above.